In the 1832 Land Lottery of Georgia, 36 lucky drawers from Lowndes County won land grants in the Cherokee Indian Territory. Among the winners were Hamilton Sharpe, Pennywell Folsom and Bryan J. Roberts, who later fought in the last Indian skirmishes in Berrien County (then Lowndes County). See Pennywell Folsom Fell at Brushy Creek and Bryan J. Robert’s Account of the Last Indian Fight in Berrien County. 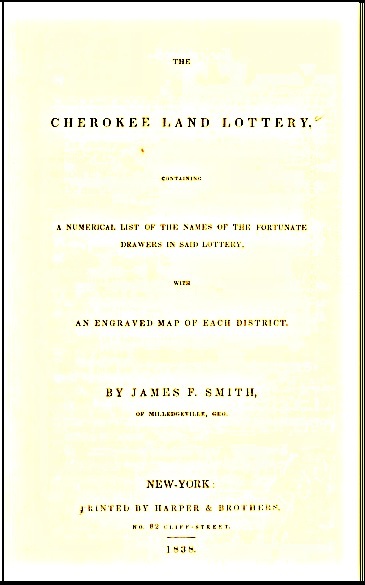 The last, or 1832 Land Lottery of Georgia, made available for distribution and settlement that part of the Cherokee Indian Nation which was in Georgia. This was a large area generally north of the Chattahoochee River in the north west and north central parts of the state. There were two distinct areas involved in this Lottery. One part was the area referred to as the gold lots, lying along the south boundary of the subject area, and the other part was referred to as the land lots. Cherokee land lots were parceled out to white Georgians in one of the two state land lotteries held in 1832. The state conducted a total of eight lotteries between 1805 and 1833. Lot 42, 6th Dist., 1st Sect., Union and Lumpkin County. Sampson G. Williams, McCraney’s, Lowndes. Lot 242, 6th Dist., 1st Sect., Union and Lumpkin County. Nancy Ivy, w., Folsom’s, Lowndes. Lot 314, 6th Dist., 1st Sect., Union and Lumpkin County. Lot 37, 7th Dist., 1st Sect., Union County. James Jamison, soldier, Barnett’s, Lowndes. Lot 273, 7th Dist., 1st Sect., Union County. Lot 321, 7th Dist., 1st Sect., Union County. Lot 128, 8th Dist., 1st Sect., Union County. Blanset Sutton, widow, McCraney’s, Lowndes. Lot 67, 9th Dist., 1st Sect., Union County. Lot 146, 9th Dist., 1st Sect., Union County. Jane Clark, widow of Revolutionary Soldier., Burnett’s, Lowndes. Lot 250, 10th Dist., 1st Sect., Union County. Lot 77, 16th Dist., 1st Sect., Union County. Lot 284, 17th Dist., 1st Sect., Union County. Lot 316, 19th Dist., 1st Sect., Union County. Jesse Carter, Jr., Coward’s, Lowndes. Lot 3, 19th Dist., 1st Sect., Union County. Lot 13, 5th Dist., 2nd Sect., Gilmer County. Lot 227, 5th Dist., 2nd Sect., Gilmer County. Lot 232, 5th Dist., 2nd Sect., Gilmer County. Benjamin S. Vickers, Folsom’s, Lowndes. Lot 45, 7th Dist., 2nd Sect., Gilmer County. Lot 17, 8th Dist., 2nd Sect., Gilmer County. Lot 214, 9th Dist., 2nd Sect., Gilmer County. Lot 183, 9th Dist., 2nd Sect., Gilmer County. John Sutton’s orphans, McCraney’s, Lowndes. Lot 257, 10th Dist., 2nd Sect., Gilmer County. John William Spain, orphan, Studstill’s, Lowndes. Lot 127, 11th Dist., 2nd Sect., Gilmer County. Lot 94, 12th Dist., 2nd Sect., Gilmer County. Lot 143, 12th Dist., 2nd Sect., Gilmer County. Lot 227, 12th Dist., 2nd Sect., Gilmer County. Lot 78, 13th Dist., 2nd Sect., Gilmer County. Robert Lindsey’s orphan, McCraney’s, Lowndes. Lot 184, 14th Dist., 2nd Sect., Gilmer County. Lot 254, 22nd Dist., 2nd Sect., Cass & Cherokee Counties. Lot 281, 22nd Dist., 2nd Sect., Cass & Cherokee Counties. Anna Davis, orphan, Coward’s, Lowndes. Lot 322, 22nd Dist., 2nd Sect., Cass & Cherokee Counties. Lot 116, 23rd Dist., 2nd Sect., Cass & Cherokee Counties. Lot 213, 23rd Dist., 2nd Sect., Cass & Cherokee Counties. Lot 221, 23rd Dist., 2nd Sect., Cass & Cherokee Counties. Lot 161, 24th Dist., 2nd Sect., Murry and Gilmer Counties. Lot 308, 24th Dist., 2nd Sect., Murry and Gilmer Counties. Lot 26, 25th Dist., 2nd Sect., Murray and Gilmer Counties. William Jerkins’s orphans, Blair’s, Lowndes. Lot 16, 26th Dist., 2nd Sect., Murray and Gilmer Counties. James Wade, Soldier, McCraney’s, Lowndes. Lot 119, 26th Dist., 2nd Sect., Murray and Gilmer Counties. Lot 324, 27th Dist., 2nd Sect., Murray and Gilmer Counties. Lot 108, 27th Dist., 2nd Sect., Murray and Gilmer Counties. Lot 237, 5th Dist., 3rd Sect., Cass County. Lot 115, 6th Dist., 3rd Sect., Cass County. Lot 129, 6th Dist., 3rd Sect., Cass County. John Jones, Jr., Mattox’s, Lowndes. Lot 200, 6th Dist., 3rd Sect., Cass County. Lot 46, 8th Dist., 3rd Sect, Murray County. Molly Burnett, widow, revolutionary soldier, Burnett’s, Lowndes. Lot 284, 11th Dist., 3rd Sect, Murray County. Lot 316, 11th Dist., 3rd Sect, Murray County. Lot 3, 12th Dist., 3rd Sect, Murray County. Note- all marked * were granted previous to January 1, 1838. Georgia’s western and northern boundary had been established in 1802 by the cession of her western territory, from the Chattahoochee River to the Mississippi, to the United States. Although this cession had provided for the peaceful removal of all Indians within these boundaries, in 1828, the Cherokee still remained. Despite the fact the Cherokee were a peaceful and agricultural people, in that year Georgia extended her jurisdiction over them and named the area Cherokee County. Shortly thereafter, the General Assembly, by the Acts of December 21, 1830 and December 24, 1831, authorized the land to be surveyed and distributed by Lottery to citizens of Georgia. In 1832 the surveyors laid off the area in four sections, the sections into land districts about nine miles square, and the land districts into land lots of 40 and 160 acres respectively. While the surveying was being carried out, those persons who had lived in Georgia three years immediately prior to the Acts of the General Assembly, registered to draw in the Lottery in their counties of residence. 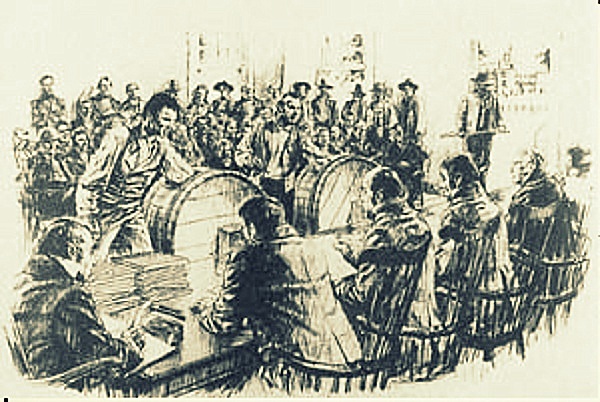 Their names, together with the numbers of the lots and districts, were sent to Milledgeville, then the capital of the state, and on specified days tickets from two wheels or drums were drawn simultaneously, one from the wheel holding the name tickets and one from the drum holding the land lot tickets. In this way, a person knew which lot he had drawn and if he subsequently paid to the state a grant fee of $18.00, a grant was issued to the lot he had drawn. This grant from the State of Georgia was his title to the lot and from that time he could do whatever he wished with his property, although the state did not require that he live on it or cultivate it. Revolutionary War veterans were given extra draws and were indicated by the letters “R.S.” written after their names. Many other classifications are indicated by initials, such as widows, insane, orphans, idiots, illegitimates, etc. Ordinary married men with their families, or bachelors, etc, are not designated by any initial. Any citizens participating in this and other Lotteries had to take only an ORAL oath when they registered to draw. Consequently, there are no written records as to what they may have said about themselves and their families. Immediately after the Lottery of 1832 was held, the whole area of Cherokee County was divided into ten counties, i.e., Cass (which was renamed Bartow in 1861), Cherokee, Cobb, Floyd, Forsyth, Gilmer, Lumpkin, Murray, Paulding and Union, all of which were created in 1832. However, the original survey and grant records in the Surveyor General Department of the Office of the Secretary of State, always use the name of the original county — Cherokee. The 1832 Land Lottery opened up the last area within the present boundaries of Georgia, which heretofore had not been available to the white settlers and was participated in by more persons than any other Lottery. In spite of the distributing of the lands in the area, it was not fully settled at first. It was not until a Treaty with the United States and the Cherokee Nation on December 29, 1835 held at New Echota in Georgia, that the Cherokee finally agreed to leave their lands and move west beyond the Mississippi River. Soon after Georgians came in in large numbers and not an Indian was left within her boundaries. Any fortunate drawer in any previous land lottery who has taken out a grant of said land lot. Any person who mined—or caused to be mined—gold, silver, or other metal in the Cherokee territory since June 1, 1830. Any person who has taken up residence in Cherokee territory. Any person who at any time was convicted of a felony in any court in Georgia.